The Witch of Westchester is a yard and home display located in - you guessed it - Westchester, Illinois. The Tourers first stopped here in 2010 since it was close to another haunt that we were visiting, The Scare on Mayfair. Although we didn't actually see a witch, which is odd given the name, we did see a lot of other things, including a giant skeletal head on the roof, some creep looking scarecrows, a ghoul guarding the back fence, and some hanging ghouls in the trees. All of the decorations had a distinct Fall look to them - not necessarily scary, but more like a traditional Halloween decorated house. None of the props was gory or bloody, but rather ones that evoked that Halloween feeling. In addition, in both 2010 and 2011 there was some live entertainment. 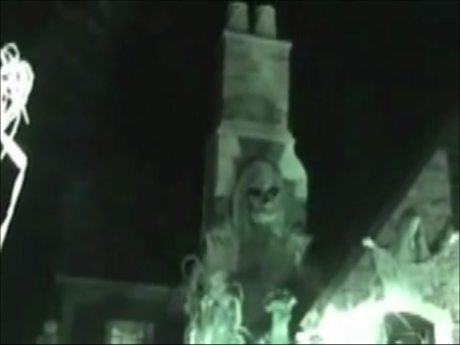 In 2010 the father and son who ran the display came out to scare visitors, with the father dressed as Jason with a chainsaw and the son dressed as Michael Meyers. In 2011 there was no Jason, but there was a mini Wolfman character with chainsaw, and a different mini Michael Meyers. Overall, the display is very nice to look at and also nice for children as it is not scary. It's also cute to see the little kids get into the season and try to scare visitors.